My daughter, once more I am here as Mother of the afflicted, Mother of sinners. I know, my daughter, that your heart is distressed, for you have just been orphaned of a director who has helped you so much for so many years, my daughter; but he has prepared you, and from Heaven, he will go on helping you, and helping this Work which he has loved so much. God allows you to see me; how much different is Heaven from Earth! Titles and appointments are worthless here; here everything is God, what greatness is that of Heaven and to see God's face! How many souls come here with a perfect life because of this place! Men call themselves practising catholic, but do they live according to the doctrine? What wonders are those of Heaven! How much I have longed for this place and this moment! You do not remain alone; from here I will watch over you. All of you fight, so that we can gather here. How can men deny the existence of Heaven and hell? 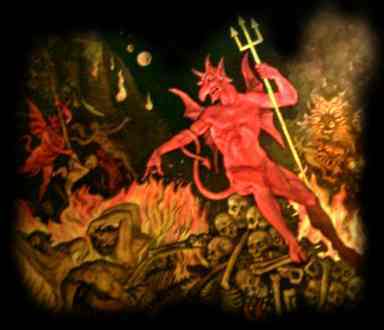 And many pastors who deny the existence of hell do not know the harm they do to souls; when they are at God `s court ! Brothers, be sincere when you preach the Gospel as it is written, so that men know the Truths, do not be afraid of explaining the Truths, because how much it is lost for not having told straightforwardly the existence of Heaven and hell! On Earth everything attracts men excepting God, and here only God attracts you. This infinite greatness, do not lose it, my children. How you dare not explain the Truths! LUZ AMPARO: Ay, what greatness, my God! Ay, father, help me! I have already come here to see God's face, how much joy all my being feels because I am impregnated with the divinity of God, sharing this greatness. What greatness and how much I have longed for this moment! This is the infinite greatness which men have to fight for; on Earth there is not any other greatness than this one; leave flatteries aside, live for God, and do not be centres, for men use to make us centres; and do not let yourselves be deceived by some little pats, for it is easy, if you do not reflect upon it, that Demon conquers you because of pride and vanity. Fight, only God is enough, love creatures, but love God above everything. How many people do not arrive here, my children, because they thought themselves gods and everything they did was for vanity and for themselves! Do not let men conquer you, conquer men for God and let God conquer your heart. Live a devoted life, love much this Work; in this Work, you will walk through a path of perfection, but, ay, if you allow flatteries and pats on the back! Do not be centres, my children, How useful this was to me, although I loved my God much, but how much good it did me. Ay, my daughter, fight, so that we are together some day. I directed your soul the best I could; follow the perfect path, of generosity, and lower yourself, my daughter,because all those who lower themselves will be raised. Do not forget anything I have taught you, and I also thank you all for all the good I have received from you. Creatures who have devoted your life to God; it is the best path, the most perfect, and the safest. Let nobody confuse you, nobody. You should remain together, and none of you should be greater than the others, love each other. How many souls are in this place sharing this grace! But they had to be lowered and trampled on to come so high. Be humble, my daughter, and do not forget my advice. Other souls are in this place. This soul is going to talk because God allows him. I am here, in the Purgatory, I am a soul who devoted my life to God, but I was not faithful to my vocation and I had other place to go, a dark place, a place where peace does not exist, where love does not exist, but by means of God's mercy I am here, and thanks to your prayers I am waiting to leave this place at any moment. It is a place of purification, but we are so happy purging our trespasses, we would not change the Purgatory for anything of the Earth, because we have seen God from afar. He has let us see a little ray and his mother has consoled us. We dont want or wish anything but God, but eternity; just to be with the Divine Majesty of God We would not change this place, although we suffer to purify our sins, for anything. I have been here for a long time, although my time is not your time, but time does not matter, it matters the place where I will go. And there are many other souls purifying themselves. Although it is a place of sorrow, it is also a place of joy. We do not want to know anything either of you or God. We would change neither our punishments nor grieves to go to Heaven. Our mission is hatred, destruction, and lack of love. It is a torment that will never end, which will never consume us. It is a devouring fire that devours our entrails; we are accursed because we did not want to love God, but I want you to advise men of such great torments existing here, so that they do not come here. The voice of God orders me so... but for me, I would drag everybody to this place where they would be consumed by fire, where hatred, destruction do not stop. Everything is bitterness and our mission is destroying souls. Many of us come here because nobody wanted to tell us the truth, and we did not want to understand it either. It was easier to live comfortably, wealthy, doing whatever we wanted without taking into account God�s will. This is our salary; we are paid by whom we have worked for. We feel hatred, contempt. If God allowed us we would destroy the world. We only feel desires for dragging all men, so that they take part in this grief. My daughter, do you see the difference between love and hate? Notice the peace of this place and the hatred, the disdain, the rancour of the other; fight, my children, do not let flatteries and commodities for your body conquer you. Be faithful to God's will; love Our Hearts, my children. Good souls enjoy such great mercy that God has had with them, because they have been able to fight, to detach themselves, to accept neither vanities nor rancour nor envies, to be poor, humble, sacrificed, to imitate Jesus on The Cross and Mary in Nazareth. Have you not seen your spiritual father, my daughter, how joyful he is in the presence of God? All his life devoted to God since his very childhood, since his nine years he started his way, my daughter. He devoted himself entirely so I gave a reward to him, to him and to you; to him the one of being you director, to you that of learning from him. That is why I ask men: receive the Sacraments, do not give prayer up, leave the world and its vanities aside, and follow a straight and safe path. In the world there is a crisis of Faith; men have lost it because they consider everything right; man has lost his moral values, and the world is full of immorality, for nothing is sin. They carry the flesh in triumph and I repeat you, my daughter, that men want to change the laws by not accepting themselves as they are, in the path of sanctity, but in the one of immorality, corrupting their bodies: men with men, women with women. But how far do you want to go, creatures, that do not respect God's laws? God created man and woman to procreate, not to enjoy, not for pleasures or passions. Men have forgotten it. I repeat you, my daughter; it is like Sodom and Gomorrah. How long does God have to be ashamed of men? Pray, my children, pray for not falling into temptation. Come to this place, my children, I only come to teach you to fulfil the Gospel as it is written, and do not create laws according to your will. Pray, sacrifice, my children, receive the Sacraments of Penance and Eucharist to strengthen your souls, for men are lukewarm because they have left God aside, day by day the Demon takes more hold of souls, and guides do not see the situation of the world: blind, your pride does not allow you either to see or accept that God appears to humble people in order to confound the pride ones and those who think of themselves as great and powerful. Pray, my children, for them. Raise your objects; all will be blessed with especial blessings for poor sinners. I bless you as the Father blesses you, through the Son and with the Holy Spirit.